"Cards That Never Were" is a recurring series in which I create cards that were somehow not created when they should have been back in the day. It is a concept I borrowed from too many others to mention, but I thank them all. My Manning mancrushes have been well-documented. It all started with Archie, the patriarch of the Manning clan. Archie was drafted in 1971 out of Mississippi by the New Orleans Saints. He played with the Saints from 1971 until midway through the 1982 season, when he was traded to the Houston Oilers (where he was a teammate with Oliver Luck, Andrew's fater). Midway through the 1983 season, he was traded to the Minnesota Vikings, where he played through the 1984 season, before retiring. Manning had football cards from 1972-1976 and then from 1978 through 1983. The 1977 omission was caused by him missing the entire 1976 season with shoulder surgery. Still, I would have thought Topps would have given him a card, considering his star status. Instead, the Saints had cards for quarterbacks Bobby Scott and Bobby Douglass. I guess three quarterback cards would have been a bit much. After being traded to the Vikings, Archie did not appear in a game with his new team in 1983. In 1984, he threw for 545 yards, while backing up Tommy Kramer and Wade Wilson. 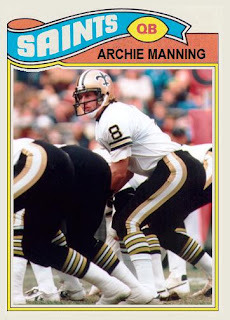 Topps did not give Archie a card for either year with the Vikings. Thanks to the magic of PhotoShop and my odd need for such trivial things, I have corrected the oversights in Archie's card history. I now present Archie's 1977, 1984 and 1985 cards that should have been. Terrific cards John. I'm hoping his son still has what it takes. But Cam and the Panthers will be tough.